ACES-Energy's experience and knowledgeable technicians offer you all the services you need to install a successful geothermal, solar or wind installation to your home or business. But don't just take our word for it, see how our customers feel about our "total package." We just received out first "minimum payment" bill from RG&E for $22! Pretty cool! AJ and Lance installed a large solar PV system for us, and we are absolutely thrilled with the results. AJ made the whole process of planning, installation and implementation very easy and straightforward. His honesty and work ethic shows through in everything that he does. He and Lance worked through some pretty nasty weather installing the system and tweaking it to insure optimal performance. We love the monitoring system as well, which allows us to keep track of many facets of performance. Thanks, AJ! A big thanks to Lance for all his hard work. I could tell he takes pride in his work as everything was very well done. He even took the extra time to clean up the basement. Everything looks very professional and he did an excellent job. Phil was great and took the time to explain everything to me regarding the repairs he helped make, so please express my gratitude to him as well. 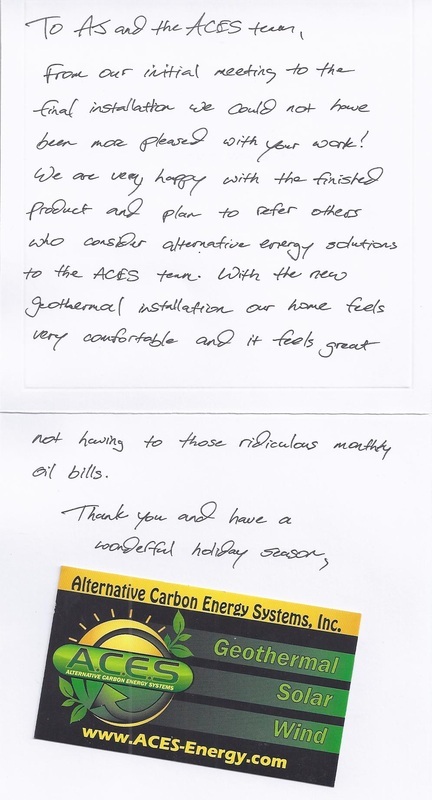 I first became a customer of ACES last year after having AJ recommended to me by my nephew...I have now had ACES complete several projects, including a large geo-thermal system, Solar PV, Solar Hot Water & Solar Pool heating project and have been very pleased not only with the pricing, but the incredible quality of all of the products, service, and installation; AJ has done an excellent job on all of the projects and I can heartily endorse and recommend both him and his firm to anyone considering one of systems---he is very honest, hard-working, and impresses me as a consumate professional in his field! hardworking, addresses issues quickly, and is detail oriented. AJ installed a 5 ton geothermal system for us and we are very happy with it. The system also included ductwork, a hot water loop for our electric hot water heater, dedicated electric meters to monitor electricity consumption of the heat pump and water heater, a smart thermostat, and a monitoring package to monitor ground loop temps and air supply/return temps. AJ and his team were very willing to have an ongoing conversation with us regarding our needs, and make any desired adjustments. His customer service is top notch and very responsive!! AJ quickly addresses any issues that may arise, and his attention to detail is excellent. We would gladly recommend him and his team to our friends and family, as we are confident they would receive a high quality installation. We researched heavily geothermal and solar and interviewed three companies intensively. We chose AJ's group because they were genuinely interested in making us better energy consumers and spent the time explaining each system and their requirements. We are very happy with the system that they installed. It works great. We have an beautiful 100 year old house that was drafty and during the winter it was either too hot or too cold depending on whether the heat kicked on or was off. Now the house stays at a very consistent temperature and we love it. Thank you AJ and Co.!!! "We live on top of the highest point in Steuben County, approximately 1/2 mile from the nearest connection to the grid. We contacted the team from ACES and they met with us a couple of times to evaluate our situation and make recommendations. They spent the next month answering our questions and working up the best system to meet our needs. AJ, Mike, and Lance are very knowledgable, professional, hard working and friendly. They get the job done! We would highly recommend them to anyone who wants an alternative energy system done efficiently." A.C.E.S. installed a Geothermal system at my father-in laws house. They were professional and completed the job when they said they would. The Geothermal Unit is working exactly as designed and the ground loop system was appropriately sized for house. My in-laws bought the system for the heating and they said that they would never use the air conditioning but since it has been installed, they love it. We are extremely happy with A.C.E.S. and the Geothermal System. After doing my research and talking with several geothermal companies, we choose A.C.E.S due to several factors. Their wealth of knowledge in the geothermal sector surpassed many of the "salesman" we spoke with. When speaking about the product and service offerings, A.C.E.S utilizes their installation crew to also "sell" the job. This provides on-the-job insight and experience that other companies did not. Also, their online geo monitoring package is unique and allows myself to track the performance of my system from anywhere by viewing it on the internet on my phone. During the engineering and install process, we met everyone of their employees and would recommend them to anyone! Just a big thank you to AJ, Mike and Lance for the fine job they did with our wind turbin. Couldn't be happier with the results. We were very lucky to have them rescue us from the last contractor. What a nightmare, and along came AJ. Nothing to worry about after that from start to finish. Thank You again. 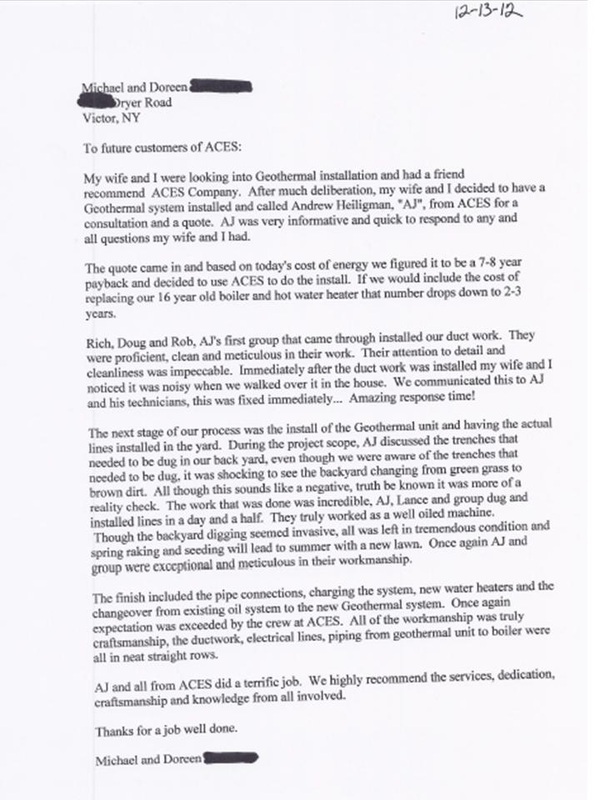 I had a 5-ton geothermal system installed by A.C.E.S in the summer of 2009. 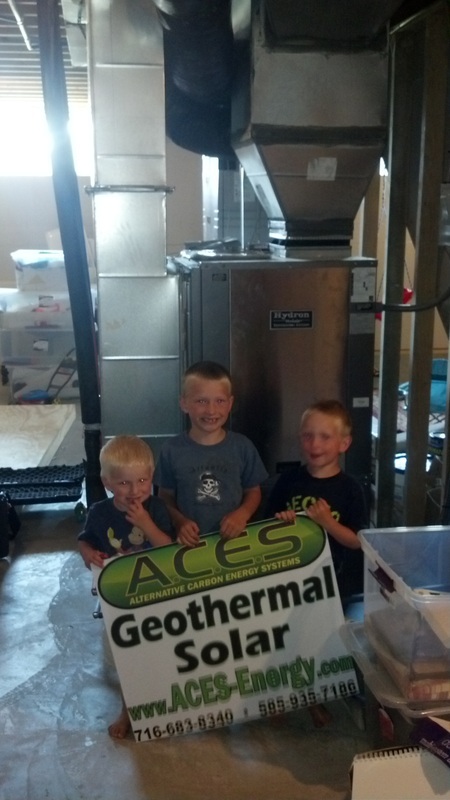 I would give A.C.E.S-Geothermal an A+ on not only their installation but also their passion for renewable energy! Andrew returned my phone calls within hours whenever I had a question! We are currently working with A.C.E.S to install a wind turbine! We are very pleased with our new geothermal system. AJ and his crew were very professional and courteous. We were impressed with the whole process, from beginning to end. AJ was very helpful in the initial system design considerations. He and his crew worked long hours, even on the weekends, to finish the job quickly so we could have our basement back, and get the new system up and running. So far we've been very pleased with the new system, and we are recommending AJ and company to friends and neighbors. We are very happy with our geothermal system. AJ and his team were great - efficient, knowledgably and very neat. Thanks! ACES-Energy installed a Geo-Thermal unit in our newest cabin at Cradle Beach, a residential camp on the shores of Lake Erie dedicated to serving the needs of WNY’s disabled and disadvantaged children. ACES work allows us to provide a comfortable and economical living space for our special needs campers year round. AJ and his team are thoroughly competent and work with the customer to scale a Geo-Thermal system that fits your present and future needs. We found AJ’s consulting and engineering expertise to be highly compatible in providing solutions for our goals of improving fiscal sustainability and growing our green initiatives. In addition, Aces’ proven Geo-Thermal system in combination with our solar project provides an invaluable educational platform to teach our campers about the importance of alternative energy sources. Let AJ and his team work for you, you won’t regret it! We are totally satisfied with the quality of their work. Helping families reduce spending on fossil fuels and put savings toward educations!